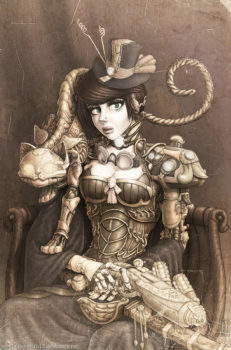 Lady Ravendale is our first Steampunk image. 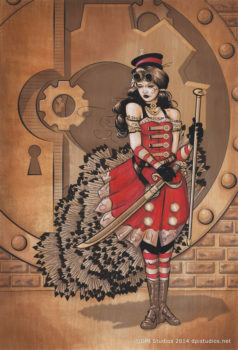 Embrio was inspired to work on a Steampunk image after seeing all of the great costumes at Dragon-Con. 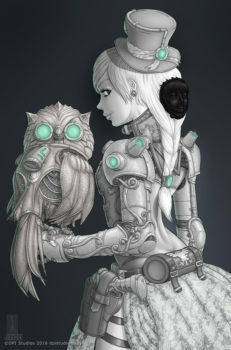 The rips and tears in the image were actually taken from a photo restoration I was doing for Embrio. His wife had an old photo of her grandmother as a child that was badly torn and he wanted me to restore it as a Christmas present. I happened to also be working on Lady Ravendale and realized the tears I was removing from the photo would work great for aging this picture. Bought the large canvas at the 2013 (I think) Calgary expo, and I just love it. 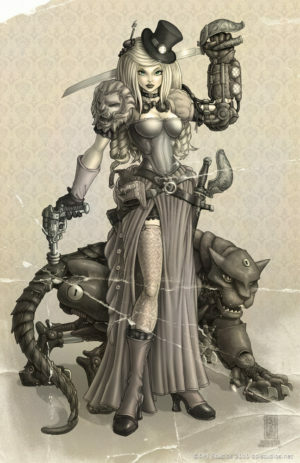 The picture on the site is nice and all, but once printed on a canvas, makes it 100% better.